How do you prime someone for a brand new sound that you are going to put out there? How do you teach them how to dance to your new groove, beat, stuttering industrial sound, etc? 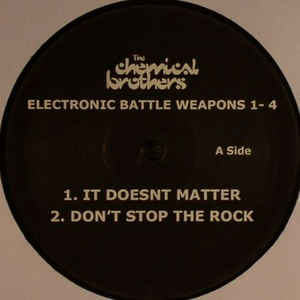 You release an Electronic Battle Weapon – in the tradition of dubplates and white labels, The Chemical Brothers release these singles as a taster of what direction they are going to be pushing in. It is not entirely dissimilar to Google’s professed idea that they are programming the environment, and interested in causing a philosophical shift in the market with some of their products, rather than actually intending to have that product be a thing itself … they are driving forward the world by constantly redrawing the map. You push the world forward into a new sonic territory of which you are the controller, because you are the originator. How can that be a bad thing? You are giving people a smorgasbord or a cheese plate so that they can sample a taster of where your head is at, and it piques their interest on what is coming next. Because the great thing is with these products is that they aren’t the full thing, and you still have to buy the album if you want to see what the masters of the game are doing with those sounds. The people who are on the bleeding edge and creating this forward sonic momentum are already five chess moves ahead of most players, so even if someone were to take this white label and do something interesting with it, it is unlikely to be as far out ahead as its originators are able to take it. 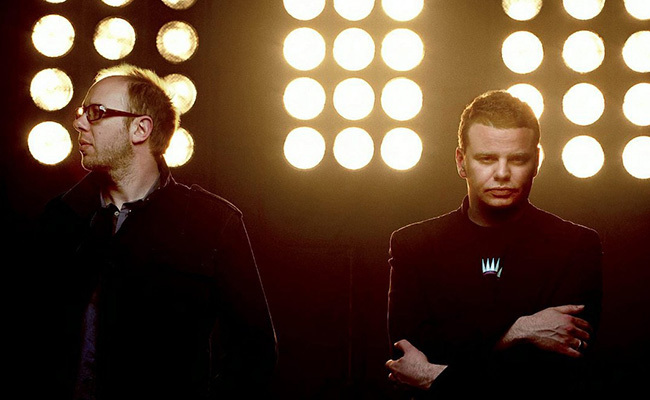 It’s one of those simple genius moves that resonates with a lot of creative people – it repurposes the single, or more likely the twelve inch, and gives it more of a robust philosophical reason for existing … other than being the most easily consumed cultural artifact in the music world. it is something that drives the environment into which it is being released. It’s kind of nice that it doesn’t have to be relegated to the b-side, the once-upon-a-time territory in which more experimental directions were explored for musicians. Warren Ellis provided an analogy in the print world with his Apparat comics which released a handful of first issues for possible directions in which comics might go. You might say that writers use short stories in a similar sense. The thing is, none of them have this actual codified and understood purpose … not that they need it, of course, but it does lend a little more impetus to them. Companies can use this as a model – everyone can use this as a model. How? Well, its kind of like beta-testing your new product – you have a number of different ideas, and your company’s future is in something of a Shroedinger’s Cat state of indeterminate nature, so instead of trying to fight against that, you create something that feeds into it and uses that uncertainty as a survey tool to prod forward the world. Being in a state of super-positional possibility is great, but you eventually want to collapse that probability wave into a decision and a forward motion – a future that condenses into something great for you. Prime your battle weapon and set your sights on that future your are always moving towards.